Minnesota bans Coursera: State takes bold stand against free education. Not in Minnesota, you can’t. UPDATE, Oct. 19, 7:07 p.m.: Common sense has indeed prevailed! Minnesota has decided to stop enforcing an outdated law that had led to Coursera telling the state’s residents they weren’t allowed to take its free online classes. For more, see my follow-up post here. Original post: Honorable mentions go to New York City’s Taxi and Limousine Commission for driving out Uber’s online taxi-hailing service and to automobile dealers’ groups in four states for trying to have Tesla dealerships declared illegal. But the grand prize in this week’s unexpectedly heated competition for most creative use of government to stifle innovation has to go to Minnesota. The Chronicle of Higher Education reports that the state has decided to crack down on free education, notifying California-based startup Coursera that it is not allowed to offer its online courses to the state’s residents. 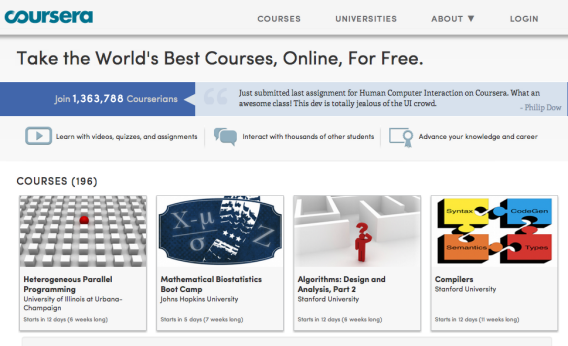 Coursera, founded by Stanford computer science professors Daphne Koller and Andrew Ng, partners with top-tier universities around the world to offer certain classes online for free to anyone who wants to take them. You know, unless they happen to be from Minnesota. A policy analyst for the state’s Office of Higher Education told The Chronicle that Minnesota is simply enforcing a longstanding state law requiring colleges to get the government’s permission to offer instruction within its borders. She couldn’t say whether other online education startups like edX and Udacity were also told to stay out. If you are a resident of Minnesota, you agree that either (1) you will not take courses on Coursera, or (2) for each class that you take, the majority of work you do for the class will be done from outside the State of Minnesota. Hear that, kids? The Internet is no place for learning. You can Facebook and Twitter and play World of Warcraft all you want, but if you want to study Machine Learning, Principles of Macroeconomics, or Modern & Contemporary American Poetry, you’re going to have to take it elsewhere. Maybe you can hit a wifi hotspot in North Dakota on your way back from buying fireworks. Update, Oct. 19, 10:58 a.m.: George Roedler, manager of institutional registration and licensing at the Minnesota Office of Higher education, clarifies that his office’s issue isn’t with Coursera per se, but with the universities that offer classes through its website. State law prohibits degree-granting institutions from offering instruction in Minnesota without obtaining permission from the office and paying a registration fee. (The fee can range from a few hundred dollars to several thousand, plus a $1,200 annual renewal.) That means that it’s Stanford, Columbia, Michigan, the University of Melbourne, et al. that are violating Minnesota law by partnering with Coursera to offer courses that Minnesota residents can take for free. The thing is, no one is wasting their money on Coursera courses, because they’re free. (Yes, says Roedler, but they could still be wasting their time.) And again, while its partners are degree-granting institutions, no one is getting a Stanford degree by taking a class or two on Coursera. At most, some classes offer a “certificate of completion.” If every government took Minnesota’s approach, free online education probably wouldn’t exist, because the cost of compliance and registration in all 50 states, let alone other countries, would be prohibitive. Here’s hoping that common sense prevails.